"Philanthropic support during the Duke Forward campaign is not only helping to sustain commitments such as financial aid and research, it is laying the foundation for important initiatives in energy, innovation and entrepreneurship, global health and the arts that will enable our students and faculty to shape our changing world," said Robert S. Shepard, vice president for alumni affairs and development. "It is exciting to see these efforts gain traction thanks to the overwhelming generosity of our alumni and friends." Duke University’s fundraising efforts this year represent a 17 percent increase of funding influx over the 2011- 2012 fiscal year. The previous funding record was $385.7 million in the 2007-2008 fiscal year. Donations so far for the Duke Forward program have totaled $1.7 billion, which is more than halfway to the program’s goal. The Duke Forward program hopes to meet its $3.25 billion goal by June 30th, 2017. "The generosity of our alumni and friends will move this university forward," said President Richard H. Brodhead. "All of us at Duke are profoundly grateful for their support, which will benefit Duke students and faculty today and in the future, giving them access to resources and opportunities that enable them to engage with the world's most pressing challenges. Lab suppliers interested in marketing life science products and working to sell lab equipment at Duke University life science marketing events may also be interested to know that Duke is a very well-funded market. Duke University received $355.6 million from the NIH in 2012. For a full list of life science departments receiving NIH funding organized by department, number of awards received and total funding awarded, please visit the NIH website. In addition to receiving $355.6 million from the NIH, Duke University was awarded $46 million by the NSF in 2012. The funding was given out to a number of projects in life science fields. Some of the programs of study receiving funding included neural systems, cellular dynamics and function, systematics and biodiversity science, physiology and structural systems, bio informatics, population and community ecology, macrosystem biology, developmental systems, evolutionary processes, genetic mechanisms, and ecosystem science. Given the most recent philanthropic, NIH and NSF funding statistics, lab suppliers may want to consider marketing their life science products and working to sell lab equipment at Duke University life science marketing events. 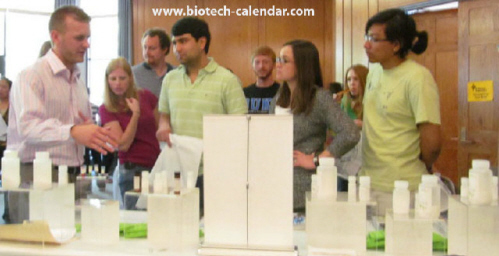 If you are a lab supplier interested in networking with others in your field at Duke University, Biotechnology Calendar, Inc. invites you to attend our annual Duke BioResearch Product Faire™ Event. Biotechnology Calendar, Inc. is a full-service science research marketing and events-planning company that has been organizing life science marketing events at top research universities across the country for 20 years. If you are interested in marketing your life science products and working to sell lab equipment at life science marketing events closer to home, we encourage you to view our 2013 calendar of events. For more detailed funding statistics on Duke University, or to learn more about the Duke BioResearch Product Faire™ Event, click on the button below.